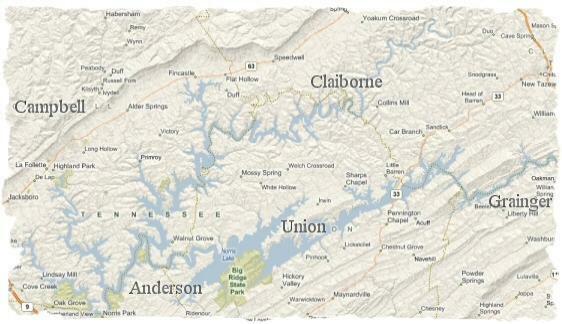 Norris Lake Cumberland Gap and the Historic Wilderness Trail marked by Daniel Boone. Along the 800 miles of shoreline, there are two state wildlife management areas, three state parks, boat docks, county parks, and public access areas. Norris extends 56 miles up the Powell River and 72 miles up the Clinch River. The lake has a surface area of more than 34,000 acres and over 800 miles of shoreline. Located in an area of ridges and valleys, it abounds in secluded coves. In some of these wooded coves-Cove Lake, Big Ridge and the area around Norris Dam-TVA established demonstration public parks, which later became the nucleus of Tennessee's state park system. The first dam built by the Tennessee Valley Authority created Norris Lake. A hydroelectric dam whose construction was completed in 1936. The dam is 265 feet high and 1,860 feet long. It contains a million cubic yards of concrete. Three years later, its completion helped moderate the disastrous Ohio and Mississippi River flood of 1937. The giant drum gates at the top of the spillway were raised for the first time to impound waters that would have swelled a flood more than 600 miles away. Norris has the largest flood control storage of any TVA dam on a tributary of the Tennessee 1,473,000-acre feet. If you are looking at buying real estate - lakefront or lake view home, condo, property or lot on beautiful Norris Lake you may want to start your search by determining what county/area would best suit your needs whether it be Anderson County, Campbell County, Union County, Claiborne County or Grainger County.